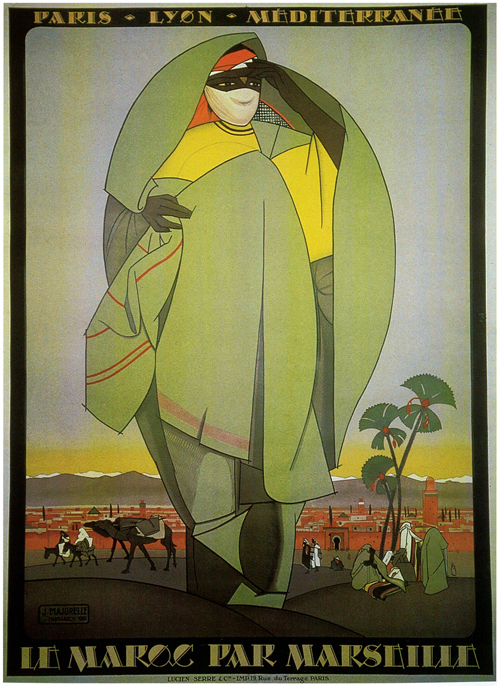 Jacques Majorelle was born in 1886 in Nancy, France, the son of the famous furniture designer, Louis Majorelle, who, with Emile Gallé, founded the Nancy School. 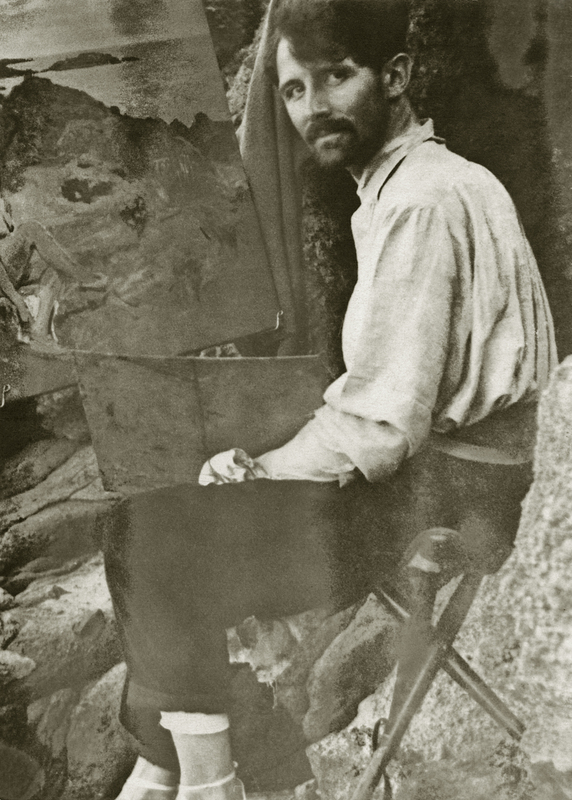 He grew up in an ideal artistic universe, among draftsmen, cabinetmakers and marquetry inlayers from the workshops of his father, at a time when the Art Nouveau movement, largely inspired by shapes found in nature, was in full swing. Majorelle harboured a lifelong love for flora and fauna. After three years of architectural studies, undertaken in accordance with his father’s wishes, Majorelle decided to dedicate his life to his primary passion, painting, and attended the Ecole des Beaux-arts in Nancy and the Academy Julian in Paris. Travels through Brittany, Spain and Italy introduced him to the power of light. His trip to Egypt in 1910 led to his fascination with the Islamic world and its culture; he lived there for nearly four years. In 1917, after being demobilized from military service for delicate health, he arrived in Morocco, invited by General Lyautey, a close friend of his father. He quickly left behind the humid climate of Casablanca and discovered Marrakech, the oasis-city whose colours, light and “souks soaked with fertile and happy life” immediately bewitched him. For several years, the city was his base for numerous trips around Africa, before he moved there for good, with his wife, Andrée Longueville, whom he married in 1919. They first lived in a little house in the medina not far from the Jemâa el Fna Square, and then at the palace of Pasha Ben Daoud. Beginning in 1917, he painted street scenes in the city of Marrakech and portraits such as that of the Pasha Thami el Glaoui in 1918. Between 1919 and 1930, Jacques Majorelle completed eight long expeditions to the south of Morocco, which provided him with the themes for his paintings of villages or souks and led to the publication of an album on the casbahs. The diary of his trip in 1922, entitled, “Jacques Majorelle, Road Trip Diary of a Painter in the Atlas and the Anti-Atlas,” was the only text he ever published. 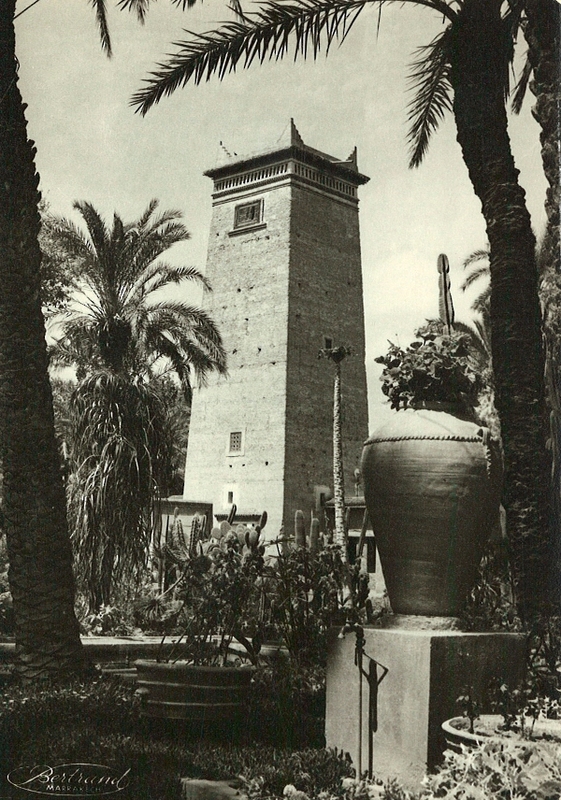 In 1923, Jacques Majorelle bought a four acre land plot, situated on the border of a palm grove in Marrakech. The spot was planted partly with poplars, revealing the presence of water and inspired the artist with a name for his new property, Bou Saf Saf. 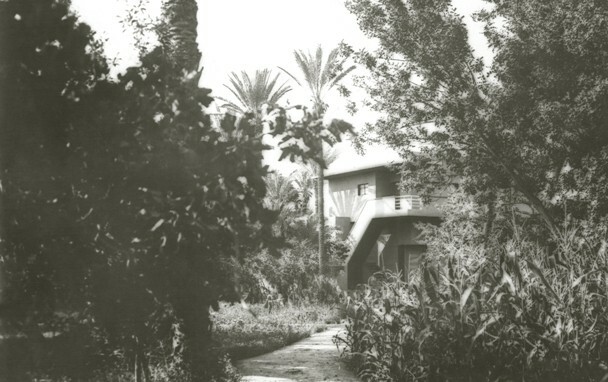 Borj which Majorelle constructed behind his villa, circa 1924. Before expanding his domain by buying adjoining parcels of land, until it reached nearly ten acres, he constructed a house in a sober Moorish style as well as workshops housed in another Berber-style building with a high adobe tower, the Borj. Alongside painting, he threw himself into the decorative arts, producing artisanal pieces, fine leather goods, carpentry and wooden painted furniture; the ceiling of a restaurant of the Mamounia, decorated with motifs inspired by Berber art, is by Majorelle. 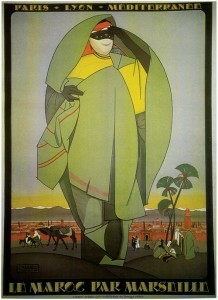 He also designed posters advertising Morocco as a tourist destination. In 1931, he commissioned the architect, Paul Sinoir, to design a Cubist villa for him, constructed near his first house. His workshop, where he would paint his large decorations, was located on the ground floor, and he established a studio on the first floor where he spent much of his time. 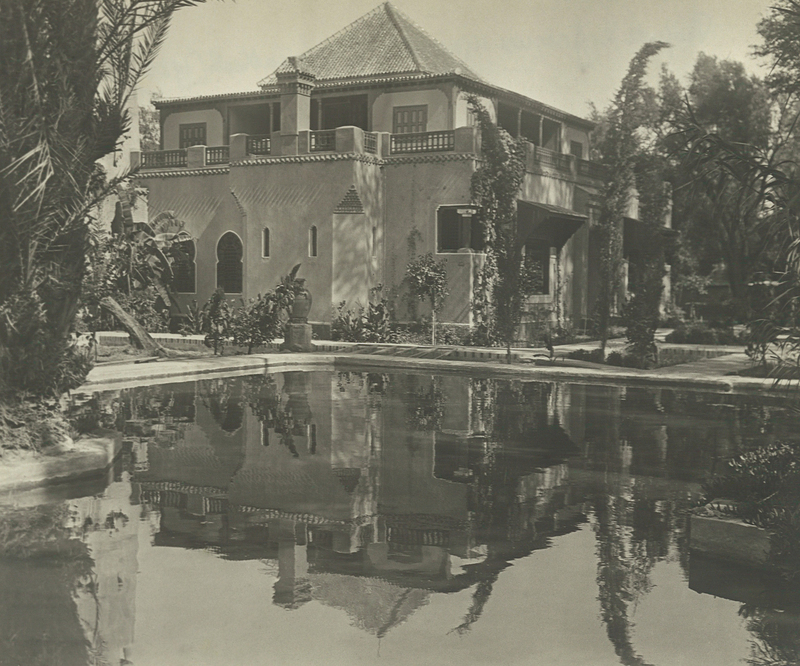 Balconies and an Arab-inspired pergola were added to the construction in 1933. This magic spot is also a “voracious ogre garden,” whose costly maintenance forced the artist to open it to the public in 1947 for the price of an entrance fee, and to divide it up following his divorce in 1956. A happy relationship with his second companion, Maïthé, was short-lived: he was the victim of a serious car accident in 1955. Numerous operations and the eventual amputation of his left leg exacerbated his financial situation to the point where he was forced, in 1961, to sell his portion of the garden and the villa-studio. Following a second accident some months later, Jacques Majorelle was sent to France, for medical treatment. He died in Paris in October 1962, without even having bid farewell to Marrakech. His grave is in Nancy, next to that of his father.